REFILL YOUR INK CARTRIDGES…SAVE MONEY!!! Inkjet refills are much cheaper than purchasing new inkjet cartridges each time your ink runs out. If you have an inkjet printer and you do a lot of printing whether it is for home or business use you will know that replacing the cartridges can be a costly business. Inkjet refills can help save you a fortune if you get through a lot of ink. Companies that offer inkjet refills and printer ink refills will be able to refill most major brands of cartridges. They will sell printer ink refills to you and recycle your old empty ink cartridges. This also helps to save the environment as there is much less waste produced if you refill your old cartridges compared to if everybody just threw them away and bought new ones every time. Many companies will sell universal ink that says it will work in any manufacturer’s cartridge but this may not be the best option. Good quality inkjet refills will include a priming tool and these are not commonly available with most generic printer ink refills. Good suppliers will sell inkjet refills that are for specific brands of printer such as HP, Lexmark or Hewlett Packard. Different brands use different ink formulations so good inkjet refills will be created so they are the same ink formulation as the original to produce just as good quality printing results. 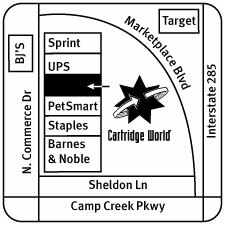 Cartridge World Campcreek uses only the best ink and the highest quality of EVERYTHING!!! We provide discounts for teachers, police, fire, veterans and students. We deliver.